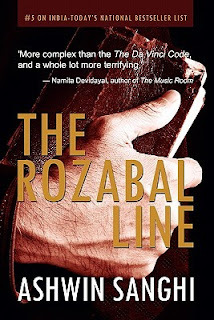 The Rozabal Line is Ashwin Sanghi's first book and it clearly shows. The plot line is mainly based on The Lost Years of Jesus Christ and on the theory that Jesus survived his crufixion and spent his last years in India. Sanghi has mixed almost all the conspiracy theories that one can associate with religion and Christianity in particular like Jesus was a Dalai Lama incarnate and learnt Hindu Vedas and Buddhist scriptures during his lost years, He married and had a family that survives to date, the Church that fears the revelation of this fact, the tomb of Jesus is located in India - Kashmir in particularthe consistent fact that Jesus was not the sole person who was born of virgin birth and was reborn from the dead, the similarities that exist between modern day Christianity and older so called pagan religions like Mithras, Zoroastrianism, Hinduism, Buddhism, the doomsday theory of 21 Dec 2012. In addition to this already heady cocktail of religious synonymy Sanghi adds an angle of terrorism inspired by radical Islamism courtesy Osama Bin Laden, championed by a secret faction of the Church called Crux Decussata Permuta funded by Opus Dei which in turn is being manipulated by The Illuminati led by the members of Order of Skull & Bones. The book reads more of a travelogue than a conspiracy thriller at some places and it becomes really difficult to manage the plot lines. In some chapters Sanghi traverse the entire known historical span starting from 3500 B.C to 1998 A.D. That's quite a leap to digest in one single chapter. After sometime the plot becomes predictable with the author hinting at his major expose quite a few times in the preceding chapters. The characters of the book are another major flaw. As there is no continuity in the plot the characters are not so well developed, the readers (in particular myself) are never given time to identify or associate with one character. The lead protagonist in this case Father Vincent is even more in dark about what's happening around him that the reader. It takes the fun out of what could have been a really, really good book. My opinion is that Sanghi had a good idea to start with but somewhere during the process of putting thoughts to paper things got screwed up to a great extent. It would have made a thrilling read if the author had the patience to try for the multi-book approach rather than trying to cram all known theories in just a few hundred pages. As a series I'm sure Sanghi would have gotten plenty of time to make the characters more believable and also he could have spent a lot of time in laying down the plot in a more organized manner than just relaying them as a collection of facts. Verdict: Skip it if you have anything better to read.